Photos are very dynamic. For one, you cannot reproduce the same photograph once taken. And two, even if you have a backup of your original somewhere safe (which you should) it would be nearly impossible to reproduce your work on an image no matter how hard you try. A typical image-editing session could entail the following: open an image, perform some color corrections, do some brushwork on the picture, erase some parts of the background that you don’t need, then do more brushwork, do a lot of work here and there, only to finally realize that you erased the guy’s ear along with the background. You can’t go through the undo steps because that will erase all the other work that has been done afterwards. You could now be faced with lots of copy and paste from the original file only to end up with an edited image that you feel belongs in the trash. What if you could get back that ear without a single undo? What if you could reduce the blur you worked into portions of the background? Below are some tips for non-destructive editing in Photoshop. Never use an eraser tool unless you are absolutely sure you will not need those pixels. Which in most cases, is never. Use masks. They are easy, non-destructive, and produce great results and tremendous flexibility. Make sure you aren’t working on the background layer. Double click it to make it a regular one. Duplicate this layer to create your working layer. Let’s say I want to apply sharpening to only a few select areas of my image and possibly a blur to others, a trick method to fake some depth of field into the image. While on my duplicate layer, now renamed “Sharpen”, I apply my sharpening. This applies to the entire image. 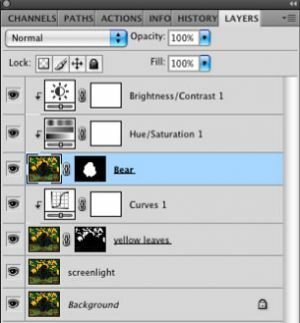 Hit the “Add Layer Mask” button at the bottom of the layers palette to add a layer mask to the current layer. The default mask is white which shows all the image on the layer. Black hides, white shows. No matter how you make it happen, just remember that. By inverting the mask (cntrl-i) I now have a mask that hides the entire layer. With a soft round white brush I can paint on the mask and uncover the sharpening effect, only where I want to see it! If I make a mistake, I simply hit X (to switch my foreground color to black) and paint over to hide those areas. With another duplicate layer I can apply a blur to the entire image, add a mask, and reveal only those areas that should appear blurred. For even greater control over these effects try using each layer’s opacity slider to reduce or increase the intensity of the effect. Additional non-destructive tools include adjustment layers and smart objects. We’ll talk about those later!